Since Mommy Unwired started in August, 2012, it has captured a dedicated audience and has continuously been increasing its readership. 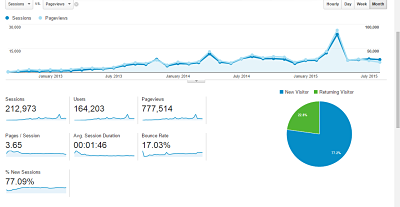 As of August 31, 2015, Mommy Unwired has an average of 212,000 visits, 164,000 unique views, 777,514 page views and a bounce rate of 17.03%. 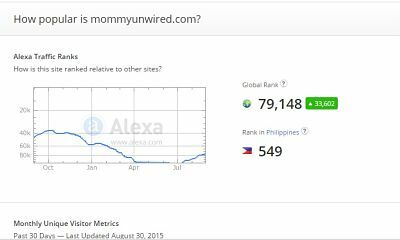 As of August 31, 2015, Mommy Unwired is ranked 79,148th all over the world, 58.468th in the US and 549th in the Philippines. The blog has a strong presence as well in social media , with every post reaching 3,195 followers in Google Plus, 1,767 followers in Twitter, and 1,541 followers in Facebook. Why work with Mommy Unwired? Mommy Unwired is a family website, reaching a wide variety of readership which includes moms looking for the best spot remover to dads looking for advice on how to deal with teen daughters to teens on how to cope with biological changes. Mommy Unwired is wired for fabulousity as well, with topics on beauty and style, making it a blog not only for moms but for everyone out there. Advertising with this site will expose your brands to a diverse audience. Each and every post I make are promoted in all social media platforms that I mentioned above, guaranteeing the exposure of your product to your target market. Ad Spaces– Sidebar Badge (250 x 250): I charge $1 for every 500 monthly average page views per month. Sponsored Posts/Product Sponsorships- I feature sponsored posts and infographics with a maximum of two back links and social media mentions as a bonus. These can either be written by you or me. Contact me for my rate. Social Media Mentions – Mommy Unwired has a strong presence in social media . I can give you an individual rate per social media account or I could also give you a friendly package for all three. Contact me here. Product Giveaways – I could host a giveaway for you. Please contact me for more details. For complete advertising information, invites, and brand partnerships, you can reach me at marie(at)mommyunwired(dot)com or my contact form.